For data-driven utilities, insights developed by integrating data from IoT devices and other sources is critical. 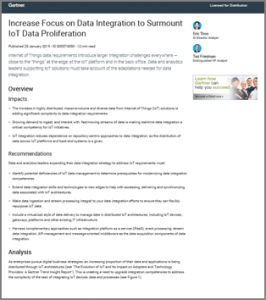 Read this complimentary Gartner report, Increase Focus on Data Integration to Surmount IoT Data Proliferation, to see how extending “data integration skills and technologies to new edges” enables utilities to more broadly access, share and synchronize IoT data with their enterprise. From generation to consumption, the data and insights derived from IoT enable utilities to improve the management and delivery of energy. Atos Codex helps utilities evaluate and make sense of IoT-enabled data using AI, machine learning and predictive analytics for a complete picture of the reliability, health and security of your power assets. As renewable energy targets continue to rise, utilities must find ways to manage the bi-directional flow of intermittent, alternative energy sources such as solar while maintaining grid stability and reliable service. Reduce maintenance costs, unplanned downtime and predict 90% of failures days before they happen. For utilities with multiple dispersed assets this could translate into millions of dollars in savings per year. Monitoring and analyzing the physical behavior of power assets can help determine when the grid is under attack. This can mean the difference between detecting an intrusion in a timely manner versus finding out only after significant damage has been done. For nearly 40 years, Atos has worked with 200+ energy and utility companies around the globe to help them optimize resources, improve performance and create new business models. Along with our industry-leading partners, we will help you to create a secure, scalable IoT analytics solution that delivers accelerated insights, increased operational efficiency and cost savings. Artificial intelligence and machine learning move to the edge. See how smart technology puts intelligence where it’s needed. Discover how to use asset intelligence to predict asset failure and enable proactive maintenance. See how Atos and its partners help maintain the health and security of all your critical industrial infrastructure. See how this DSO used real-time usage data to forecast and balance between renewable production and local consumption. Renewables: move from mitigating renewable impacts to leveraging these assets to improve grid resiliency and reliability. Need more information on Atos Codex Managed IoT?